I think I’d like Dexter to announce that its (already picked up) fifth season is going to be its final one. For all of the show’s virtues, at this point, it’s become incredibly obvious that the show has turned into the cable equivalent of a solid B-show, instead of the truly awesome subversion of the crime drama it could have been. To my mind, the show’s second season was easily its best, despite the fact that it also featured one of the show’s worst characters ever in the misconceived Lila. 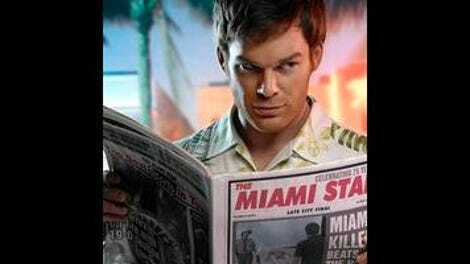 In that season, Dexter seemed at every turn to be in genuine danger of being caught, and even though it was obvious he would eventually slide out of his predicament with no one the wiser, the show expertly turned the screws to him by forcing him to deal with the fact that Doakes had figured out his secret, that the search for the Bay Harbor Butcher was always in danger of realizing he was said Butcher and that Lundy was always one or two clues away from reaching the same conclusion as Doakes. The longer any show runs, the more that show is going to have to soften its characters, to some degree, simply because extended periods of time around anyone will mostly make you think more highly of them. What troubles me more is that Dexter, season two, was the only season to deal as directly as possible with the fact that what Dexter Morgan is doing – killing killers – is still immoral and illegal. Minus Doakes, the show doesn’t have anyone to voice that opinion, especially since Dexter has gotten so good at hiding what it is that he’s doing. Though the show’s other two seasons have come at this idea at various points, neither has engaged with it as fully as the material probably requires, since we have to see Dexter, to some degree, as a lovable hero if we’re going to keep watching. Other shows with antiheroes solved this problem by surrounding the antihero with a variety of compelling supporting characters, but Dexter has never quite solved this problem and, instead, chooses to deal with this problem by bringing in a new guest serial killer or two every season. This season, the show has brought on John Lithgow as the Trinity Killer, the great white whale of Lundy (who’s back, retired and occasionally tracking the serial killer no one will believe him exists). He doesn’t get much to do in the premiere, but damned if he isn’t terrifying all the same. The opening moments of him slicing a girl in the thigh and letting her bleed out in her bathtub as he cradles her, naked, push the show’s horror quotient way up (and are almost demonically filmed), while the later scene of him standing alone in a rusty old public shower and pushing the water hotter and hotter while moaning loudly is also sublimely creepy. I rather liked the story featuring Jimmy Smits’ Miguel last season when it finally got going (which took a long while), but so long as this one doesn’t stay disconnected from the main players for too long, Lithgow’s tossing off of his comedic persona of recent years is compelling enough that it easily becomes the episode’s highlight. I was fully prepared to have all of the stuff featuring the non-Dexter cops to be kinda boring, since it’s always kinda boring. Yeah, Deb and Anton are settling into their relationship, and Quinn is flirting with a reporter or something (I’m not sure why this matters just yet, but it might end up being important though I’m not holding my breath). And I suppose it’s a “shock” that Angel and Laguerta are having an affair, but it would be more of a shock were either of these characters developed beyond a stock series of character traits. I get that the temptation in writing this show is probably to load up on the Dexter monologuing and creepy horror sequences, but it’s seriously hindered the series’ long-term lifespan, simply because none of these characters are terribly interesting, outside of MAYBE Masuka, who’s only interesting insofar as it’s fun to see him interact with Dexter. What I was not prepared for was just how boring the stuff featuring Dexter would be in this premiere. Outside of a nicely effective murder sequence in an abandoned boxing ring (shot with cathedral-like lighting that heightened the shadows and drama of the moment), the titular character now has a wife and baby and life in suburbia, and it’s … just about what you’d expect it to be, right down to all of Dexter’s voiceovers about how he doesn’t have time to do what he wants because he’s always having to deal with the baby. Honestly, plopping Dexter in suburbia and having him deal with things like being overtired from dealing with his child seems like such a golden concept that it all feels a little lazy, as though no one thought about this storyline beyond Dexter having to deal with living the life of a normal family man. There weren’t a lot of story beats here that I couldn’t predict until the closing car crash, which, yeah, was the sort of thing that made me wonder just how he’s going to get out of this one (presumably just barely and in the nick of time and etc.). Which all brings me back to why Dexter needs to end its run sooner, rather than later. Dexter is only interesting insofar as we can feel the push and pull between the true malevolence of his acts and the persona he’s sold to himself of the friendly neighborhood serial killer. The longer the show runs, the more it leans toward the latter, which creates a tonal problem. You can’t do a long-running series about a human monster and also try to make him a cutesy, cuddly beast turned loose in suburbia. At some point, Dexter is going to have to ultimately reckon with everything he’s done, even if the show doesn’t deign to have him pay for those misdeeds (which is fine). The longer Dexter runs, though, and the less danger Dexter is in of being caught, the more danger there is that the show will finally just side entirely with Dexter being a quirky sociopath who sometimes commits murders and less with his dark passenger. Without some sort of ultimate reckoning, Dexter will never have to look into the mirror and, more crucially, neither will we. If I sound pissier than usual (I am! ), it’s because Dexter’s second season is legitimately one of my favorite seasons of drama this decade, and I don’t think the show has ever lived up to the promise it showed there in any of its other seasons (yes, even the much-vaunted season one). That said, it’s worth pointing out that Michael C. Hall’s performance remains top-notch, as does the filmmaking on the show. Those shots of Dexter’s car approaching the camera from the horizon, initially appearing as just a speck of light, are top-notch. Finally, check out this excellent post on the premiere and how Dexter is really 24 from Myles McNutt.